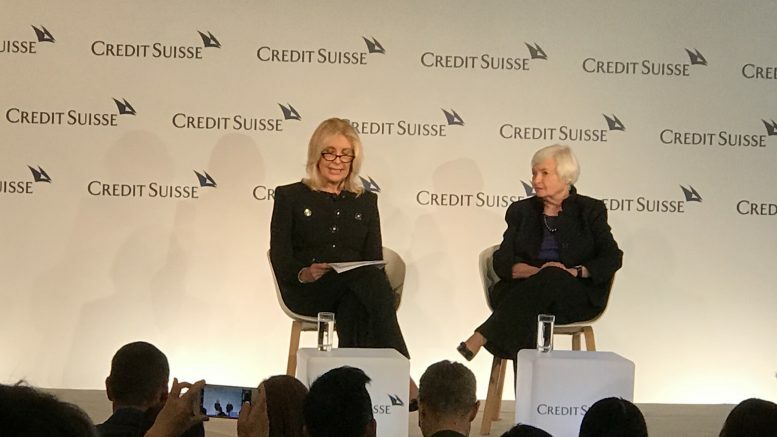 Former Federal Reserve chief Janet Yellen (right) at the Credit Suisse Asian Investment Conference in Hong Kong on 25 March 2019. Former U.S. Federal Reserve chief Janet Yellen said on Monday that global central banks don’t have enough bullets in their policy guns to deal with a crisis. “We generally look to be in a low short rate environment for unfortunately as far as the eye can see,” Yellen, who headed up the U.S. central bank from 2014 to 2018, told the audience at the Credit Suisse Asian Investment Conference in Hong Kong on Monday. “If its true that we’re in that type of environment for quite a long time to come, we do have to worry that central banks are not going to easily have the tools to adequately respond,” she said. Yellen added that the U.S. was a bit ahead of the game, partly by having achieved an inflation target of around 2 percent, while U.S. short-term rates are a little under 2.5 percent, which while low, were “significantly” up from zero. In addition, using forward guidance has helped to drive down longer-term interest rates, she said. Yellen noted that historically, in a recession, the Fed would cut short-term rates by as much as 5 percentage points. “That capacity doesn’t exist now,” she said. Another concern: Short-term rates have generally come down across developed markets, she noted. “It’s not only because of the financial crisis. It looks like it predated it,” Yellen said, adding that there may be common causes, such as low productivity growth, aging populations and slow labor force growth, which have been weakening investment spending and the demand for funds. She said that in any future global crisis, the Fed may be able to step up with swap lines with other countries, a politically sensitive tool it made use of during the Global Financial Crisis, which began in 2007 to 2008. Central bank swap lines provide liquidity of one country’s currency to another country’s central bank. The Fed’s swap lines involved the foreign central bank selling its currency for dollars at the market exchange rate, with an agreement the currency will be bought back at the same exchange rate, with an interest payment, after an agreed period. The receiving country’s central bank can then distribute the dollars to its banks. “Congress has not given the Fed a mandate to be a lender of last resort to the world’s financial system,” Yellen noted. But added, at the time, the Fed made the case that it was in the interests of the U.S. However, it’s not all on the central banks, or even just the Fed to respond to an economic crisis, Yellen added, saying it would be “wise” to also turn on the fiscal taps. If interest rates are set to remain low, debt-to-GDP (gross domestic product) levels can rise, and the interest-rate payment burden isn’t as high, she said.